The JR AXIS is designed to provide unmatched stability to even the most aerodynamically challenging model, without sacrificing the feeling of natural flight. Thanks to the AXIS's intelligent stick priority design, aggressive flight manoeuvres are still possible with no loss of control authority even at high gain settings. AXIS detects the optimum Heading lock effect proportionally to the stick position. Pilots can have the feel of full control authority while still receiving the full stabilization benefits that AXIS can offer. The setting procedure is JR Easy. AXIS parameters can be set using any DMSS Transmitter or via the AXIS Assistant PC interface. JR XBus or Futaba SBus compatible. JR easy setup - setup directly from JR DMSS radios or PC assistant. Multiple wing and tail types available. Gyro includes a throttle output for simple 6 channel setups. Existing JR XBus users can plug AXIS in-line for a quick, easy, clean and no fuss setup. The throttle channel has a 70Hz output to be compatible with most ESC's. Note: Both PWM and XBus outputs can be used simultaneously. e.g. 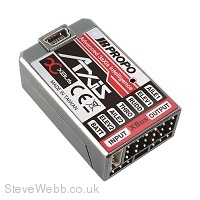 Use XBus for both right and left aileron and use a PWM output for throttle.